August 19, 2016 – The middle class is getting crushed. But there is hope. The most common argument about the middle class destruction is the declining or stagnant income, which is true. 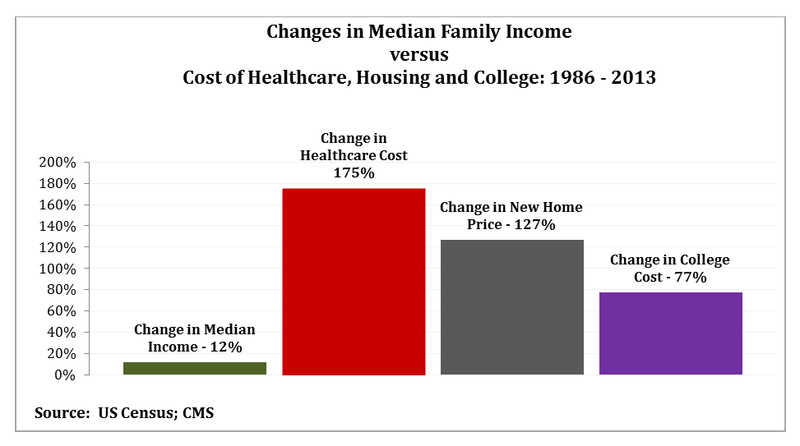 However, the main culprits are the costs of healthcare, education, and housing that have increased at a much higher rate, making it impossible for an average American family to attain a middle-class lifestyle (see chart below). Furthermore, the tax policies have exacerbated the problem by creating after-tax income and wealth inequality, favoring the non-working income taxed at a lower rate than the working income. Despite the doom and gloom about the middle class making headlines, there are three major forces working together—women, millennials, and technology, which provide hope for the future.